Image caption Mild exercise for mild depression? The report's authors showed "walking was an effective intervention for depression" and had an effect similar to other more vigorous forms of exercise. They said: "Walking has the advantages of being easily undertaken by most people, incurring little or no financial cost and being relatively easy to incorporate into daily living." However, they cautioned that much more research needed to be done. There are still questions over how long, how fast and whether walking should take place indoors or outdoors. Prof Adrian Taylor, who studies the effects of exercise on depression, addiction and stress at the University of Exeter, told the BBC: "The beauty of walking is that everybody does it." He added: "There are benefits for a mental-health condition like depression." How any form of exercise helps with depression is unclear. Prof Taylor said there were ideas about exercise being a distraction from worries, giving a sense of control and releasing "feel-good" hormones. 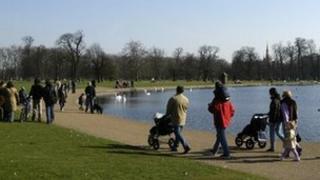 The mental-health charity Mind said its own research found that spending time outdoors helped people's mental health. Its chief executive, Paul Farmer, said: "To get the most from outdoor activities it's important to find a type of exercise you love and can stick at. Try different things, be it walking, cycling, gardening or even open-water swimming. "Exercising with others can have even greater impact, as it provides an opportunity to strengthen social networks, talk through problems with others or simply laugh and enjoy a break from family and work. So ask a friend to join you."